Stains on rugs are inevitable, no one intends to purposely stain an area rug. But hey, things happen. Here are some tips to remove various types of stains from your area rugs. Before you begin removing the stain, dab the area and blot it well to dry it completely. The idea is to work on the stain itself, so removing the entire excess liquid first will help you achieve a better result. Blotting gently is recommended, you don’t want to scrub, it will ruin the fibers of the carpet. Juices, alcoholic drinks, and sodas would fall into this category. Mix together a simple solution made of a ¼ teaspoon of non-bleach detergent or even white vinegar mixed with 32 ounces of water. You should always check the manufacturer’s suggestions first, but for special liquids like wine, coffee and tea, 1 tablespoon of ammonia mixed with 1 cup of water tends to do a better job. Avoid using this on wool or wool blend carpets. Keeping your area rugs and carpets maintained is important to having them last a long time. Depending on the fibers, material blend or manufacturer guidelines, you should take caution when cleaning even the smallest stain. 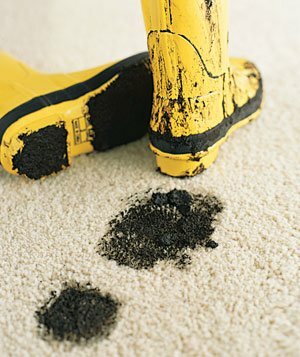 Rely on a professional rug cleaning service when the stain is bothering you but you’re afraid to attempt to clean it. They have the experience necessary and the blend of detergents required for the various types of fibers and fabrics. It is best to avoid spilling in the first place, but we all know accidents happen. We hope these tips will help you when the big oops happens! But, we also encourage you to avoid doing it yourself and rely on a rug cleaning professional.